The first published map of the St. Louis area. Map of the Country of the Illinois. A map of 'superlative' rarity, this is Victor Collot's 1796 map of the Mississippi River in the vicinity of St. Louis, Missouri, or what at the time was known as the 'Country of the Illinois.' Focusing on the Mississippi River valley, this map covers from the confluence of the Mississippi, Fort St. Lewis (St. Louis, Missouri) and the confluence with the Missouri River, as far as the confluence of the Mississippi with the Illinois River. The map is extraordinarily detailed throughout being the finest map of any part of the Mississippi River yet published. It identifies numerous towns, ruins, and businesses, and American Indian settlements, including Bourbon, St. Genevieve, Gabory, a 'wooden fort,' Luzieres, numerous 'salt works,' Kaskaskias (the first European village in the region), 'windmills in ruins,' Fort Chartres (ruins), St. Philip, Hull's Town, Sandy Meadows, Denis, New Design or Corne de Cerf, Fountain, Carondelet, St, Louis, Florissant, Marais des Liards, and St. Charles. Most of these towns have since been erased by the meandering Mississippi or subsumed into the urban sprawl of modern St. Louis. It also notes the remarkable American Indian mound builder citadel of Cahokia. In addition, Collot has identified various roads, mountains, lakes and ponds, cliffs, swamps, the current of the Mississippi River, 'Indian Ancient Tombs,' and unnamed farmsteads. Relief is rendered in hachure. French settlement began in 1703 with the founding of the town of Kaskaskia, which was followed by Fort Chartres (identified here as 'Ruins of the Town and Fort of Chartres') in 1718. 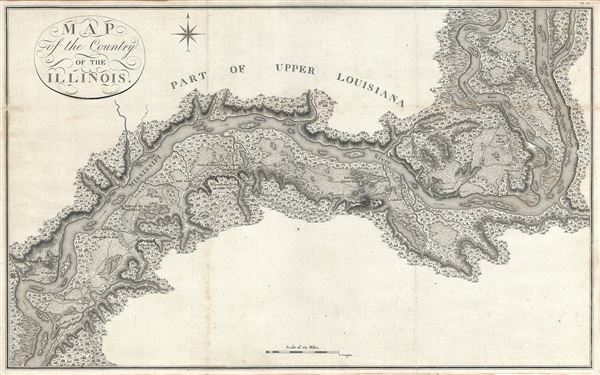 In 1763, when the Treaty of Paris that ended the French and Indian War dismantled most of French America, the vicinity of Fort St. Lewis (St. Louis) was the most densely populated French enclave south of the St. Lawrence Valley and north of New Orleans. In 1786, eager to recover New World territory lost by the deposed French monarchy, the Directoire Executif assigned Victor Collot, then Governor of Guadeloupe, to complete a clandestine reconnaissance of the Mississippi. At the time this region was divided between Spain, which controlled New Orleans and the west bank of the Mississippi, and the United States, which dominated all of the territory east of the Mississippi (with the exception of Florida). Collot's mission, in addition to assessing the military preparedness of the region, was most likely to rally French colonists and their American Indian allies in support of a renewed push for French empire in America. Collot did not however pass unseen, a fact that underscores just how remarkable his highly detailed maps and notes were, for he must have been under near constant scrutiny by suspicious Spanish officials. Collot himself records keeping two copies of all notes so that, if one were seized by the Spanish, he would have a spare. When he arrived in New Orleans on October 27 of 1796 he was arrested by Carondelet, the Spanish Governor of Louisiana. He was subsequently exiled from Spanish America on December 4. Back in France Collot spent 4 years preparing his notes, but the politically sensitive material was suppressed due to Napoleon's efforts to reclaim Louisiana via the 'secret' Treaty of San Ildelfonso. Louisiana returned to French control in 1800 and Collot was named commissioner. Nevertheless, in 1803, just before Collot planned to leave France to take up the post, Napoleon, strapped for cash after years of incessant warfare, decided to sell Louisiana to Thomas Jefferson in the famous Louisiana Purchase, possibly the most significant political event in the history of North America. Collot's great work, Journey in North America, which included this map, among others, was finally printed in 1805. It included several fine maps and engravings by Pierre Francois Tardieu, one of the finest French engravers of the period. Collot, unfortunately, died in the same year, a fact that further frustrated attempts to release the work. The volumes were shelved for 21 years until they fell into the 'hands of M. Bertrand, an eminent publisher in Paris, who reserved 100 copies of the English and 300 of the French edition, and made waste paper of the remainder' (Rich, Bibliotheca Americana Nova, 2:185). Thus we know that only 400 possible copies of this map exist, many of which have found their way into institutional libraries. Of the remainder, we have no way of knowing how many might have survived the subsequent century. Truly a once in a lifetime opportunity for the right collector. Georges Henri Victor Collot (March 21, 1750 - May 15, 1805) was a French military officer, colonial administrator, spy, and explorer active in the West Indies and Spanish Louisiana during the second half of the 19th century. Collot was born in Chalons-sur-Marne, France in 1750. He joined the military after school and was sent to the New World to fight alongside George Washington in the American Revolutionary War. He eventually attained the rank of Major General and in 1793 was made governor of the French colony of Guadeloupe. This position proved short lived as the colony was shortly thereafter seized by the British, who sent Collot to New York to face legal charges. Cleared of wrongdoing, Collot was commissioned by Pierre Adet, French minister to the United States, to complete a detailed clandestine reconnaissance of military preparedness in the Ohio and Mississippi River Valleys, presumably in anticipation of a French repossession of Spanish Louisiana. Collot's superlatively scarce one year study included a detailed two volume report and some of the finest maps and views of this region ever produced. Political sensitivity related to Franco-Spanish Treaty negotiations and the Louisiana Purchase delayed the printing of his work until 1805. Collot died later in the same year after which his work was shelved and largely forgotten. It was rediscovered in 1826 by prominent French publisher M. Bertrand, who recognizing it value, release it in extremely limited quantities. Only 300 copies were issued in French and 100 in English, all other volumes from the 1805 printing, Bertrand destroyed. Despite being published posthumously by 21 years, Collot's work Journey in North America, Containing a Survey of the Countries Watered by the Mississippi, Ohio, Missouri, and Other Affluing Rivers, proved to be his greatest legacy. Collot, G. H., A Journey in North America, containing a Survey of the Countries watered by the Mississippi, Ohio, Missouri, and other Affluing Rivers; with Exact Observations on the Course and Soundings of these Rivers; and on the Towns, Villages, Hamlets, and Farms of that Part of the New World; followed by Philosophical, Political, Military and Commercial Remarks, and by a Projected Line of Frontiers and General Limits, (Parid: Bertrand) 1826. Very good. Minor wear on original fold lines. Backed on paper (can be removed). Rumsey 4664.018. Phillips, P.L. (Maps) p.327; Phillips, P.L. (atlases) 1214-28. Streeter 1789; Eberstadt 137-132; Buck 48; Sabin 14460; WC 31a:2a; Howes, W., U.S.iana (1650-1950): A Selective Bibliography in which are Described 11,620 Uncommon and Siginficant Books Relating to the Continental Portion of the United States, C601. Rumsey 1076.005. Wheat, Carl Irving, Mapping of the Transmississippi West, 1540-1861, 236 (publicaton). Karrow 1-1228. Brown University, JCB Library, E826 C714j / 2-SIZE. Holland, The Mississippi River in Maps and Views, 58, 65, 70-71.